Add toothsome whole wheat spaghetti to your spiralized zucchini dish for more flavour and texture. 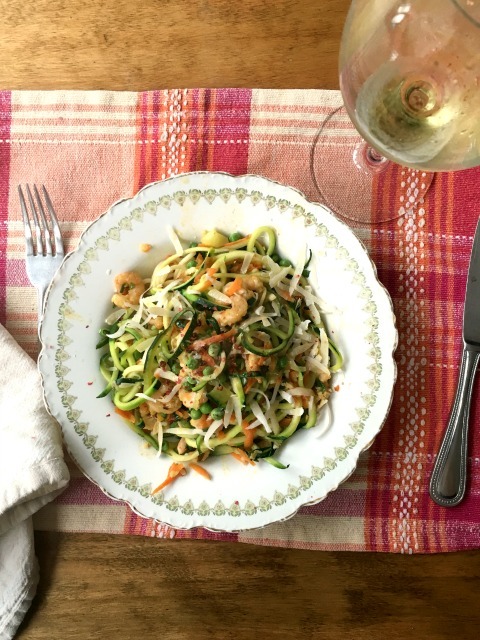 To introduce my middle school cooking class to the wonders of the spiralizer I added a bit of whole wheat spaghetti to my shrimp and zucchini noodle recipe. It got the students over the "too much green" hump and gave the dish more flavour and texture. They devoured the dish and the only thing some picked around was the shrimp. For this recipe I like to heat everything just enough that the zucchini is hot but still has a bit of bite to it. And I use the little cold water shrimp. Look for them in the freezer section of your grocery store and choose a sustainably fished MSC certified brand. Cook spaghetti according to package directions, reserving ½ cup of the cooking water. 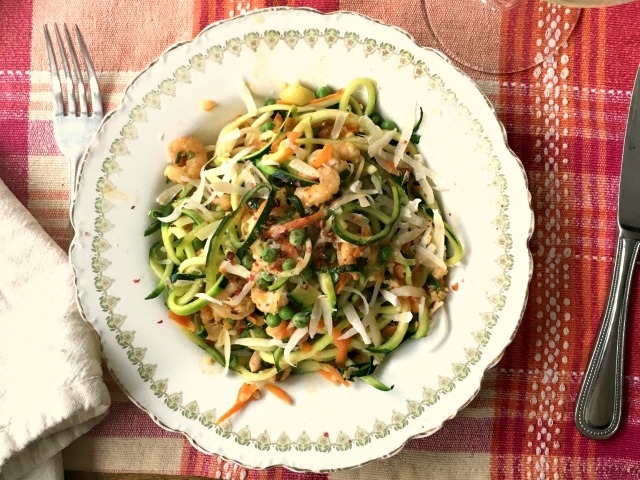 Spiralize zucchini and carrot and set aside. Warm a large saute pan or wok over medium heat. Add oil until it shimmers and then toss in green onions and garlic. Cook for one minute then add the paprika & chili flakes. Cook another minute then add shrimp. When warmed through, add spiralized vegetables and peas. Toss to combine with sauce and when the vegetables are just warmed through add the cooked pasta and a little of the reserved cooking water. Toss until heated through, season with salt & pepper. Add more reserved cooking water if you need/want more sauce. Squeeze over the lemon juice and sprinkle with the lemon zest, parmesan & parsley.